Ergonomic design includes padded back support and a customizable strap for comfortable extended use. comfortable with soft padding and deep airflow channels that work to improve circulation. Net weight :0.9KG. Camera Laptop Backpack Shoulder Bag Case + RainCover For DSLR Canon Digital etc. It has a webbed side pocket and a Velcro strap above for carrying a small tripod. It also features a padded, zippered side pocket for a water bottle or other accessories. It also has inside pocket for filters or other accessories. 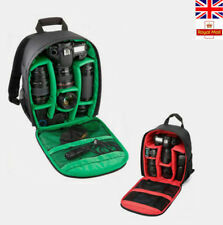 Hama Rolling Camera and Laptop Bag Miami 200 Trolley Backpack Rucksack. Condition is New. Dispatched with Royal Mail 2nd Class. Also with a laptop pocket and a tripod holder. Material: Nylon. The bottom of the bag uses special waterproof material, easy to care. Main material: nylon. 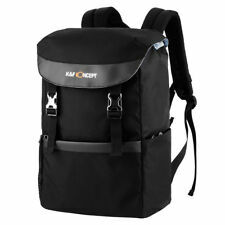 Zecti Dslr Camera Laptop Bag, Backpack, Rucksack. Dispatched with Royal Mail 2nd Class. Rugged backpack in new condition. Never used and still has the tags on it. Safe storage for a full size dslr, several lenses amd tripod. Space for a laptop and accessories. There is a video review on Youtube if you search zecti camera bag. These are normally for sale at over £60. Grab a bargain in time for the summer season! Built to last due to the high specification design and materials used. This is in addition to the many accessory pockets and the lockable section for a small laptop. Easy access and organisation for your gear with fully customisable main section and front organiser pocket. 1 x Waterproof bag. Stylish design With soft interior orange, purple, red and green lining. Material: Nylon. We are professional manufacturer to produce TV Wall Mount,Dog Harness,Dog Bed,Make Up Trolley,Mirrors,Garden Stand,Solar Led,Car Holder products and 3C Accessories. It is the perfect bag for carrying your tech gear, personal gear or both. For DSLR Laptop Drone. Dedicated pocket for a 15” laptop. All Our Products are 100% Genuine, Sourced From Authorised UK Suppliers. Brand new bought it and never ever used. Tag still on. Beautiful strong and stylish bag! 1st item £7.95. 1st item £0.00. - Suitable as hand luggage. USB - Fuji. USB - Canon. - Handle with soft padding. USB - Casio. Security & Safety. DOMKE IGUANA BACKPACK Versatile backpack, holds loads of gear, can be configured into two sections to carry gear and other personal items. Shoulder straps and waist belt can be folded away as demonstrated. Waterproof cover also included. Large Tamrac Backpack Camera Backpack SAS accessory belts. Condition is Used. Dispatched with Hermes Home Delivery. This backpack has never been out the house. I basically used it as a lens store. 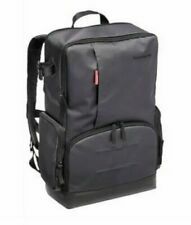 It can hold a large DSLR and 4 lenses in the main compartment and has a padded slot for a 15” laptop. 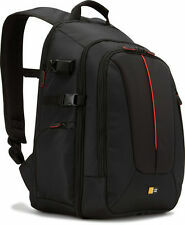 Manfrotto (MB MA-BP-TL) Advanced Tri Camera, DSLR, Laptop Backpack - RRP £141.95. Condition is New. Dispatched with Royal Mail Signed For® 2nd Class.